Sloan Digital Sky Survey spectroscopy of this inconspicuous blue object -- SDSS1102+2054 -- reveals it to be an extremely rare stellar remnant: a white dwarf with an oxygen-rich atmosphere. How stars end their lives depends on how massive they are. Large stars are thought to die in explosive fits andcollapse into the densest objects in the universe ? black holes and neutronstars. Smallstars languish as dim objects called white dwarfs. But what happens tostars right on the border is not certain. Now astronomers have observed two peculiarwhitedwarfs that may represent the end point for these objects. White dwarfs can be about the size of Earth, but containroughly the mass of the sun. They have already burned up most of their fuel andshine weakly by releasing heat. Most white dwarfs are made of compacted carbonand oxygen, with small amounts of a few other elements. The new observations found, for the first time, two whitedwarfs that contained much more oxygen than carbon, perhaps representing theend stage for stars that are between seven and 10 times the mass of the sun ? justunder the mass threshold for neutron stars and blackholes. "These are literally the first two white dwarfs whichhave this kind of chemical composition," said Boris G?nsicke of the Universityof Warwick, lead author of a paper describing the finding in the Nov. 13 issueof the journal Science. "These stars may define the upper boundary ofstars that can make white dwarfs." 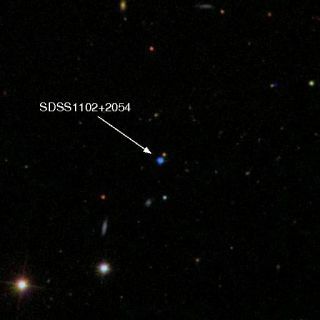 The stars, called SDSS 0922+2928 and SDSS 1102+2054, are 400and 220 light-years from Earth, respectively. While stars are still young they power themselves by burninghydrogen and helium in nuclear fusion reactions in their cores. Our sun isstill doing this, but at some point in a star?s life, it will run out of thisfuel and its gaseous outer layers will puff up and float out into space. Thenthe inner parts will condense; just how compacted they get depends on thestar's mass. The hugest stars will crumple all the way down to neutronstars or even black holes, while the majority of stars will stop at the whitedwarf stage. This is the predicted fate ofour sun. But the most massive of white dwarfs will undergo anotherperiod of nuclear fusion where they burn up carbon to form the element neon.That's what researchers think the newly-discovered stars are. "Models predict that if you go to the top end of the massrange of white dwarfs, they manage to burn most of the carbon layer,"G?nsicke told SPACE.com. "These two stars definitely have lower abundancesof carbon." The researchers discovered the stars using spectroscopy datafrom the Sloan Digital Sky Survey. They hope to take more detailed follow-upmeasurements that could confirm whether there is neon present in the stars,which would result from the carbon burning.